Sony has announced that its Tablet S and Tablet P mobile devices will soon support the newest Android 4.0 “Ice Cream Sandwich” operating system, according to TG Daily. The upgrade will enable the tablets to leverage NFC technology, including the new peer-to-peer “Android Beam” sharing app, as well as gain support for a biometric facial scanner (“Face Unlock”) and improved speech-to-text functions. According to TG Daily, Sony has not yet set a date on when the devices will be eligible for upgrade, but nonetheless the company remains one of the first tablet makers to pledge its commitment to Ice Cream Sandwich. 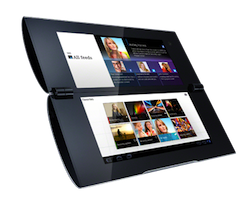 Sony’s Tablet S debuted in September on the Android 3.0 “Honeycomb” OS, while the clamshell form factor Tablet P (pictured) has yet to be released.